Selected as a 2018 CHOICE Outstanding Academic Title! An Illustrated Theory of Numbers gives a comprehensive introduction to number theory, with complete proofs, worked examples, and exercises. Its exposition reflects the most recent scholarship in mathematics and its history. Almost 500 sharp illustrations accompany elegant proofs, from prime decomposition through quadratic reciprocity. Geometric and dynamical arguments provide new insights, and allow for a rigorous approach with less algebraic manipulation. The final chapters contain an extended treatment of binary quadratic forms, using Conway's topograph to solve quadratic Diophantine equations (e.g., Pell's equation) and to study reduction and the finiteness of class numbers. Data visualizations introduce the reader to open questions and cutting-edge results in analytic number theory such as the Riemann hypothesis, boundedness of prime gaps, and the class number 1 problem. Accompanying each chapter, historical notes curate primary sources and secondary scholarship to trace the development of number theory within and outside the Western tradition. Requiring only high school algebra and geometry, this text is recommended for a first course in elementary number theory. It is also suitable for mathematicians seeking a fresh perspective on an ancient subject. To view the author's website for sample syllabi, quizzes, student project ideas, and Python programming tutorials, click here. Undergraduate and graduate students interested in number theory. 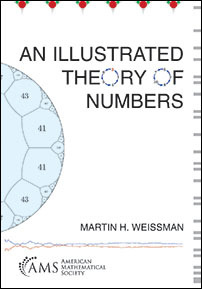 This book is an introduction to number theory like no other. It covers the standard topics of a first course in number theory from integer division with remainder to representation of integers by quadratic forms. Nearly 500 illustrations elucidate proofs, provide data visualization, and give fresh new insights...The page layout is exquisite...Each chapter begins with a figure on the left side and text on the right side of a two-page spread. Chapters end with historical notes and exercises, each exactly filling two facing pages. The historical notes reference original sources, often outside of Western tradition. It is rare that a mathematics book can be described with this word, but Weissman's 'An Illustrated Theory of Numbers' is gorgeous! Weissmann (Univ. of California, Santa Cruz) not only wrote a great textbook on number theory but also did so in a visually stunning way. The work is full of hundreds of beautiful visuals that complement the otherwise difficult subject matter. Any reader with a high school geometry and algebra background will be prepared to read, understand, and enjoy this text...most readers will love this work because they will be able to see numbers for the first time. This is a meticulously written and stunningly laid-out book influenced not only by the classical masters of number theory like Fermat, Euler, and Gauss, but also by the work of Edward Tufte on data visualization. Assuming little beyond basic high school mathematics, the author covers a tremendous amount of territory, including topics like Ford circles, Conway's topographs, and Zolotarev's lemma which are rarely seen in introductory courses. All of this is done with a visual and literary flair which very few math books even strive for, let alone accomplish. 'An Illustrated Theory of Numbers' is a textbook like none other I know; and not just a textbook, but a work of practical art. This book would be a delight to use in the undergraduate classroom, to give to a high school student in search of enlightenment, or to have on your coffee table, to give guests from the world outside mathematics a visceral and visual sense of the beauty of our subject. Weissman's book represents a totally fresh approach to a venerable subject. Its choice of topics, superb exposition and beautiful layout will appeal to professional mathematicians as well as to students at all levels.